Tomorrow, 8 a.m.: NHLPA voting on the new CBA ends, and the union says it'll release a statement once it does. Tomorrow, shortly after 8 a.m.: Gary Bettman says the league will release the 2013 schedule "immediately," once NHLPA has ratified the agreement. Sunday: Training camps officially open. Players are allowed to practice at team facilities currently, but their coaches can't have any contact with them. The Rangers practices, for instance, are being run right now by Chris Cosentino, the coach of NYU's club hockey team. Next Wednesday: One report says that tickets will go on sale leaguewide on January 16, three days before the season begins. But it looks like at least one team is putting tickets on sale sooner than that. Next Saturday: The regular season reportedly begins. 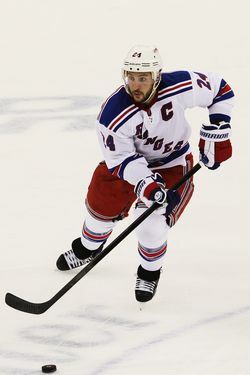 Not all 30 teams will be in action — with no intra-conference games, it's not possible — but the Rangers will reportedly open the season in Boston on Saturday, then host Pittsburgh on Sunday in their home opener, though a report out of Pittsburgh says that the Penguins have asked the league if they could play their second game of the season (the one on Sunday) at home.